Every year around this time we do the accounts. What have we done in the past year? We look back to discern things that happened which distinguishes this year from other years. We search for things that stand out as a deviation from routine. Maybe it has to do with modern Western view on life as a linear journey with a distinct beginning and a definitive end. Maybe in other cultures, where life and death are just stages in the perpetual cycle of generations, this obsession of progress is less marked. In fact, most of our lives is about repetition anyway. But an end-of-year blog summing up things that have remained exactly the same will not be very interesting reading. So let me first give you the accounts. Then I’ll return to why life in the future might be more circular. To communicate some of the cool KTH water research, we produced the exhibition ”Get Wet” for the KTH library which has thousands of visitors every day! Another new feature was the Water Expert Portal aimed at making it easier to find relevant water experts at KTH. Speaking of experts. 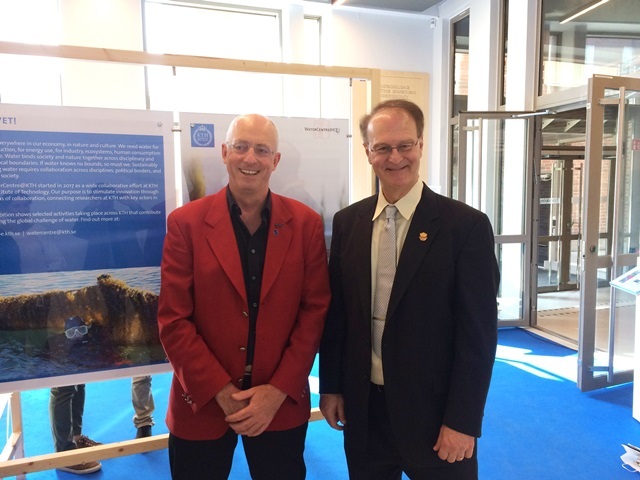 The visit of this year’s Stockholm Water Prize Laureates; Mark van Loosdrecht and Bruce Rittmann, was another highlight. These superstar experts spent a whole morning at KTH talking with students and staff about their water research. 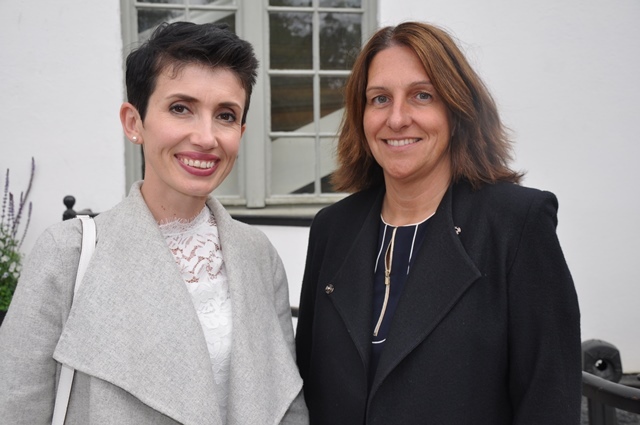 In May, KTH signed a new partnership agreement with Värmdö Municipality. This partnership is already a very lively one, with project courses by master students, field trials of more sustainable desalination technology, and preparation of a new testbed for small-scale water supply. 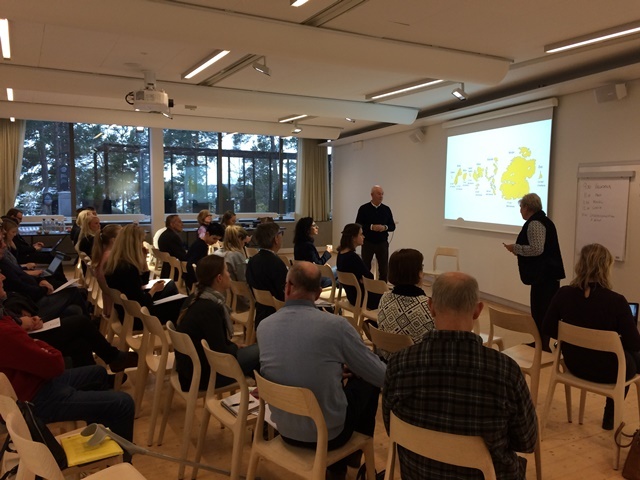 Our collaboration with IVL, SEI and City of Stockholm has also deepened in the course of the year. Through our collaboration initiatives, we have been able to catalyse several new research projects. In the MISTRA InfraMaint programme, old networks for piped water and transport meets the digital age. How can sensors and artificial intelligence change the way we manage infrastructure? KTH contributes knowledge from structural engineering, environmental economics and industrial management, in close collaboration with the city of Stockholm. The programme runs for 4 + 4 years and comprises a broad range of actors, coordinated by RISE. In a new Formas-funded project, a KTH team with competence in energy, water and innovation studies collaborate with ten private and public organisations to understand the system effects of on-property technology for water and heat recovery. A year ago I wrote a blog post about this phenomenon, and its fantastic that we now can learn more about it together with other actors. We also congratulate our new colleague Dr Timos Karpouzoglou for managing to secure a grant from Formas to compare informal water provision systems in low-income areas of the metro regions of Nairobi and Delhi. These new projects, including a generous contribution from the city of Stockholm, means 25 fresh millions (kronor) to KTH. Not bad. Finally. The year which passed showed us all with uncomfortable clarity that water is a finite resource. As I pondered in an earlier blog, maybe the summer of 2018 was, with extreme heat, fires, and water scarcity, a glimpse of our future. In this not so distant future we will need new ways of managing water. The key will be to go from linear flows to circular. Every kid in elementary school knows the hydrological cycle. Yet, all our technical systems for water in human settlements have adopted a linear approach. In the linear approach, water is just a transport medium for carrying human waste. Cheap and easy. But it depends on nature’s moderation of the hydrological cycle, and a cycle turn-around fast enough for our ever-growing demand. During 2018 we launched the ”Circular Water Challenge”. In the coming year, we will work with communities and students on eight islands in the Baltic Sea to look for solutions for water scarcity, where re-use of water will be at the centre stage. If you are interested in this project please contact Christian Pleijel at KTH Executive School. Moreover, we have begun building a wide coalition for circular water solutions. What started as an attempt to write a Vinnova application will hopefully grow into a national knowledge network for circular water technologies, including actors from municipalities and public agencies, private sector and academia. Curious? Drop us a line! Changing from the linear to the circular will require not just a shift of knowledge and practices. It also requires a shift of attitude. We need to challenge our own ideas about what wastewater is and can be used for. Take the example of Pu:Rest, a beer produced in 2018 by our partner IVL and the Carnegie Breweries. 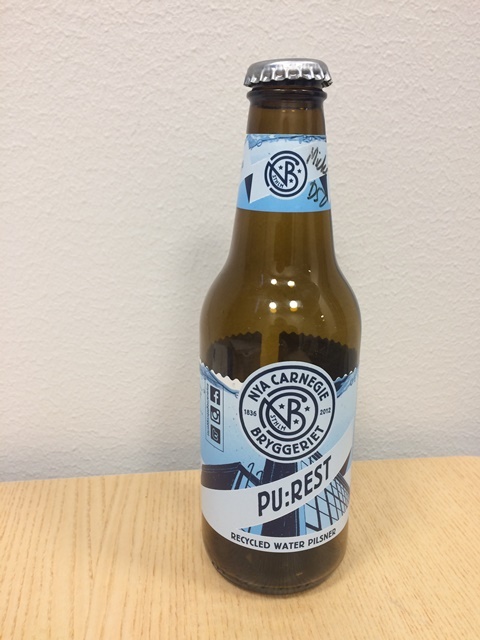 A crisp nice lager made out of wastewater from the Hammarby Sjöstadsverk, the experimental treatment plant co-owned by KTH and IVL. Kudos to IVL and Carnegie for that! In the future perhaps ”recycled” beer will be the standard drink at our monthly WaterPubs. Quite naturally, circular water approaches will become more common as water becomes more scarce. Since water is life, maybe our lives will also be more circular. Well done David and your comrades! Many super exiting projects and ideas you list. Good luck and God Jul! Previous Previous post: En reflektion runt Mål 6 och över gränsöverskridande kommunikation; vatten, sanitet och mänskliga rättigheter.